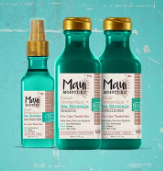 Maui Moisture is a refreshing and reparative line of hair care products developed with exotic botanicals and plant essences found on the tropical islands. This new collection, comprised of handcrafted shampoos, conditioners and hair treatments, is the first in the marketplace to use pure aloe juice as the first ingredient, replacing deionized, chemically treated water, and infuses all formulas with pure coconut water. Using aloe juice as its base, each Maui Moisture product is super rich in minerals, electrolytes and vitamins. The result is a deeply nourishing and restorative hair treatment from root to tip for hair that’s soft, shiny, healthy, and strong. Maui Moisture is crafted into seven amazing ranges for all different hair types and textures to help get hair looking healthy. An escape to the Maui Islands with every use. The ranges include Curl Quench + Coconut Oil for curly hair; Heal & Hydrate + Shea Butter for dry, damaged hair; Strength & Anti-Breakage + Rich Agave for chemically damaged hair; Smooth & Repair + Vanilla Bean for frizzy, unruly hair; Thicken & Restore + Bamboo Fibers for weak, brittle hair; Nourish & Moisture + Coconut Milk for dry hair and Color Protection + Sea Minerals for color treated hair. I tried the Color Protection + Sea Minerals for color treated hair collection. Each unique tropical blend is designed to boost hair’s natural beauty, heighten awareness of the senses and restore one's inner sense of beauty and balance. This shampoo was inspired by the ocean. Dive deep into hydration with the Maui Moisture Color Protection + Sea Minerals Shampoo. Starting out with aloe vera and coconut water instead of just water and infused with sea minerals, algae, and sea kelp, this blend free from silicones, parabens, SLS, gluten and vegan friendly; it is sure to help hair color stay as vibrant as your inner mermaid with a healthy looking glow and moisturized strands. Apply shampoo generously to wet hair, massage into a lather through to ends and then rinse the hair thoroughly. After shampooing you may repeat if needed but do follow with conditioner. Warning: avoid contact with eyes. If contact occurs rinse immediately. For best results use in conjunction with other Maui Moisture products. The shampoo smells just amazing. (This shampoo contains such great oceanic ingredients as algae, spirulina, kelp and sea water) The algae and sea kelp are what help keep color in the strands and help keep hair looking vibrant. I have used many shampoos for color treated hair in my time. All of them have started out with water as the primary ingredient. I like that this does not. Water just dilutes the ingredients in the shampoo. This is a great shampoo that makes hair feel wonderful. It lathers nicely, is rich and makes hair feel clean while also making it feel soft and creamy at the same time. Another thing, I also like that this product contains sulfate free surfactants. I still need to use my conditioner as this product is not enough to help with the damage my hair has incurred, and Maui Moisture knows this, which is why they suggest to use the conditioner too. I will definitely want to use this again. With the Maui Moisture Color Protection + Sea Minerals Conditioner, you can 'swim' your way to hydration and longer-lasting color. This conditioner is infused with sea minerals such as algae and sea kelp. The blend is free from silicones, parabens, SLS, gluten, and is vegan friendly. It will definitely help to keep hair color stay as vibrant as your inner mermaid with a healthy looking glow and moisturized strands. After shampooing, apply the conditioner to hair, working through to ends from a little bit past the roots. Wait 3-5 minutes. Rinse hair thoroughly. Warning: Avoid contact with eyes. If contact occurs rinse immediately. For best results use in conjunction with other Maui Moisture products. This conditioner smells amazing. (The conditioner contains such great oceanic ingredients as algae, kelp, spirulina and sea water) The algae and sea kelp are what help keep color in the strands and help keep hair looking vibrant. Unlike other conditioners that one uses in the shower right after shampooing, this conditioner is left on for 3-5 minutes, which tells you that it helps to repair damage and it actually does work on hair. Not only does it keep color vibrant but it helps to lock in color and works on hair strands to smooth the cuticle down, leaving hair less frizzy, more smooth and hydrated than before and also softer and more moisturized. All of these things are very important with color treated hair, which loses these properties when hair is colored. Also the fact that water is not the first ingredient is very helpful as it makes the ingredients in this conditioner more potent. I found this conditioner to be very good. It left my hair feeling softer, more hydrated and less frizzy than other conditioners for color treated hair. The Maui Moisture Color Protection + Sea Minerals Heat Shield Mist is a great product to have on hand if you blow dry your hair or if you use heat stylers like a flat iron or curling iron. Shield your strands from the heat and keep color more vibrant looking with infused sea minerals, algae and sea kelp. This ocean inspired mist will protect strands from heat and fading color, all while being free from silicones, parabens, SLS, GMO's, gluten and is also vegan friendly. To use, spray onto clean, damp hair then blow dry with round brush. This product contains algae, spirulina, kelp and sea water. It also helps to keep color looking vibrant when used on dry hair with heating tools such as a flat iron and curling iron. For best results use with other Maui Moisture products. What I really liked about this product was that it is helpful in keeping my color more vibrant than just using the shampoo and conditioner alone. I often blow dry my hair, I don't often use heat stylers on it though. So for me, this is helpful in keeping color from fading from just using the blow dryer on it, which can get pretty hot. My hair has gotten very long over the past few months and I need something to help keep the color looking its best. I don't wash my hair more than twice a week just because of the fact that I do not want to have problems with fading. But with summer coming up, I know that will have to change; with an increase in perspiration and oiliness in the scalp. Normally my hair is very dry. My scalp is super dry too. In the summer I increase how often I wash my hair to three times a week or more just because of the heat. I was very happy with the Maui Moisture Color Protection + Sea Minerals Collection. The price is excellent on every product, it is very accessible to anyone. Not only that but I feel that this line works very well at maintaining my color better than other mass market lines, even better than some professional lines. Maui Moisture is available at Ulta, Walgreens, Target, CVS, Walmart, Kroger and other mass market retailers. Like Maui Moisture on Facebook: https://www.facebook.com/MauiMoisture/ and Follow Maui Moisture on Instagram: https://www.instagram.com/MauiMoisture/.